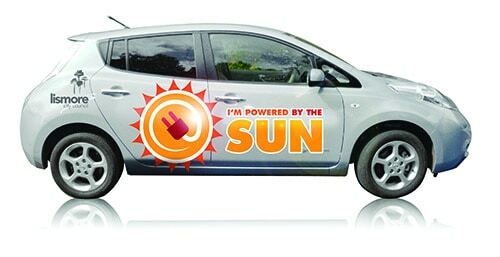 We have added a 100% electric car to our fleet! The Nissan Leaf does not use any fossil fuels and plugs into the wall at the Lismore Recycling & Recovery Centre so it can charge straight from the rooftop solar panels. The Leaf has lithium-ion batteries and can travel up to 170km on a full charge. It features a small solar panel on the rear spoiler which powers many of the interior accessories via a 12-volt battery. Some of the car parts are even made from old products including water bottles and plastic bags. While the Leaf is unable to drive long distances in between charges, it is perfect as a Council pool vehicle driving between meetings and events. It even has a fake engine – just to make people feel more comfortable! The electric car is another step toward Lismore City Council’s bigger picture goal of generating all electricity from renewable resources by 2023.